I wanted to experiment with Belgian endives; I know they are a bit bitter (I've sometimes had their leaves in salads) and great sources for vitamin B, potassium, selenium, and fiber. I started with an idea for braised endives that I found and modified. Here is what I did. I cut off about a quarter inch from the base and then scooped out a cone about 1/2" deep from the center (as illustrated on the Belgian endive.com recipes page). In a sauce pan with a little bit of olive oil, I gently cooked four endives for a few minutes along with thin slices of shallots, turning occasionally. Then I added a cup of hot vegetable broth, a bit of salt, and even a pinch of turbinado sugar, then simmered, partially covered, for about 20 or 25 minutes. It came out well! The broth added a nice flavor and cut the bitterness. I'd like to try a dish like this followed by maybe layering in a casserole dish the cooked leaves with roasted fall vegetables or maybe eggplant or other vegetables. I also served a oh-so-tasty white sweet potato; as soon as I cut it open, it released a nice perfume. 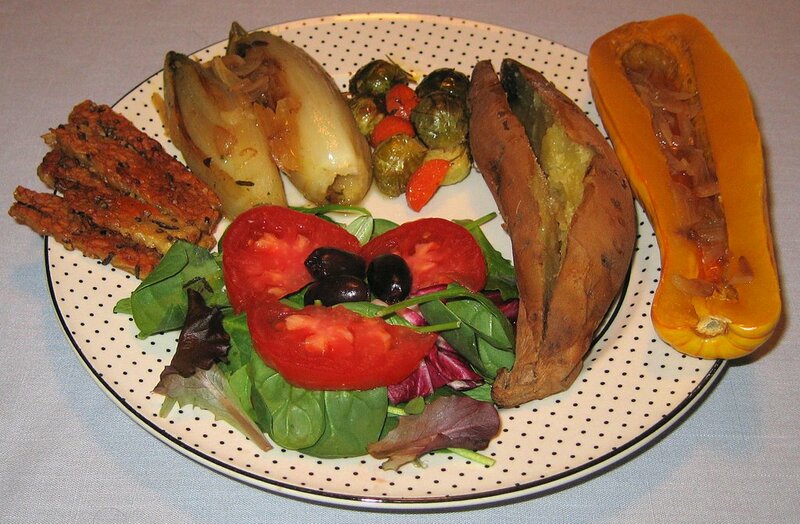 I baked delicata squash as well, and served it with hot sauce and the broth-shallots from the endives. I prepared carrots and Brussels sprouts pretty much like I did the roasted potatoes yesterday, and sauteed some tempeh. 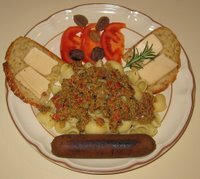 Artichoke hearts, basil, pine nuts, tomato slices; half no "cheese"
Eggplant, sundried tomatoes, roasted red bell peppers, pistachios; half no "cheese"
Red onions, banana peppers, green olives, mushrooms, potatoes; half no "cheese"
So tonight was my last dinner I'm cooking for the year! Happy 2007 to all! Thanks to jenny of the living vegan blog, I found SnapShirts, which can generate (and produce t-shirts) custom word clouds. 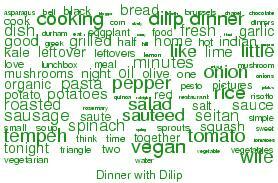 I pointed it over here to my blog today, and it came up with the word cloud above. 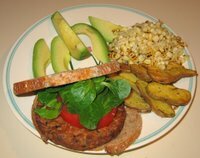 I wasn't in a cooking mood today and wasn't sure what to make, but when I stopped by the grocery store today, I found a new vegan burger made primarily with tempeh by Turtle Island Foods called a Super Burger. I planned my dinner around making such a burger. I first split some Russian Banana Fingerling potatoes in half, lengthwise, and tossed them with fresh rosemary pieces from my garden, Sweetwater Growers' infused roasted garlic rosemary oil, and salt. I sprayed a little bit of extra virgin olive oil on a plate and laid the potatoes, cut side up and in a single layer, on the oven-proof plate, and roasted it at 425°F in the oven for about a half hour. I also roasted three ears of corn over the gas range right on the flame, stripped the kernels, and mixed in salt, lime juice, and Earth Balance non-hydrogenated margarine. As for the burger, I just lightly sprayed a little olive oil on either side of each patty and put it in the oven for about 10-15 minutes, then served it on whole wheat farm toast. The burger was quite tasty - thick and substantial with a nice smoky taste. Tonight a couple whom I met when I lived in Connecticut was about an hour away visiting relatives, and they came to see us and have dinner together. It's been a while since I made risotto, and I've in particular been thinking of making it with butternut squash, apropos to the season. I have never peeled butternut squash but suspect it wouldn't be easy; I was prepared to do so today but was surprised to see at Whole Foods Market (in Durham) for the first time I have noticed cubed raw butternut squash! I bought it and just had to cut the cubes a little smaller. 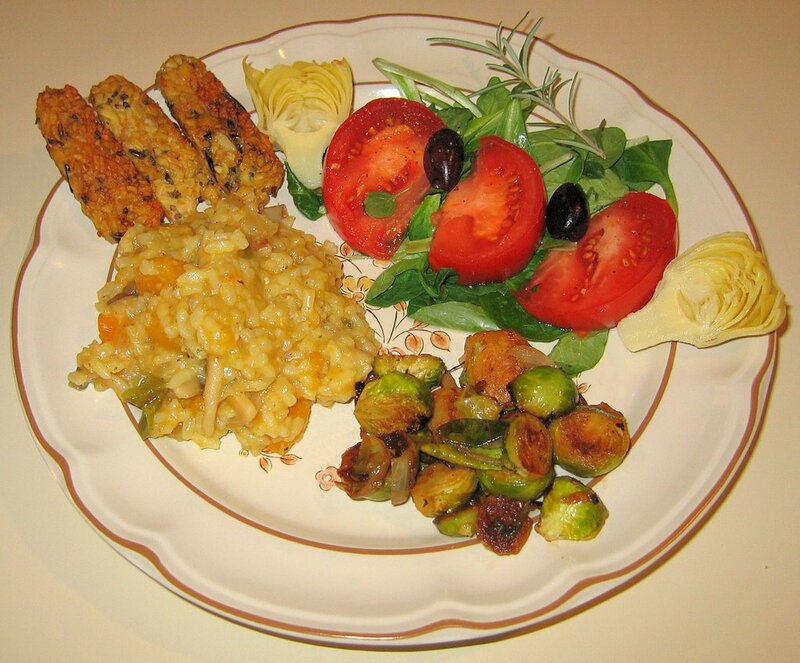 I made butternut squash risotto, along with Brussels sprouts with shallots and seasoning with hot sauce and Colgin Liquid Smoke, simply sauteed tempeh with soy sauce, and a salad (including mâche or "lamb's lettuce", artichoke hearts, Kalamata olives, tomatoes, and fresh herbs and seasonings). It's probably easier to follow the earlier description of making risotto, but I prepared about 4 1/2 cups of vegetable broth. I chopped into a medium dice most of a medium onion, and, in a heavy nonstick pot, sauteed the onion with the squash for 4-5 minutes or so till the squash started softening and the onion was becoming clear. Then I added a bit over a cup of arborio rice and stirred till the rice was mostly clear and not white, just a minute or two. I added a cup of Chardonnay wine (almost any white wine could have done), and stirred till the wine got absorbed, another minute or so. Then I spent the next half hour or so adding a ladle or so full of the hot broth and occasional pinches of salt, stirring the mixture. I made sure to never have the rice swimming in liquid, but always moist. Partway through I added some mushroom slices and small cubes of green bell pepper. I used up all the broth and in the end added some vegan Parm! "parmesan cheese" and freshly ground black pepper. It came out well! My appetite is back! On the last two nights, I ate almost a typical amount of food for dinner, and today seemed to be back to normal. We went away for Christmas Eve and much of Christmas to show my wife's friends the NC Mountains and enjoy the holiday with a friend who just recently (partially) moved into a lovely home there. We bought a wide variety of foods and I did a trivial amount of cooking to put out a buffet feast for Christmas Eve. On Christmas, Sangeeta's friends flew out in the evening, and my wife and I had an Indian dinner with my parents (I had an urge to try making a "grilled sheese" sandwich out of Bute Island Foods' vegan "sheese", and did that with their Cheddar with Chives flavor for a side dish - it came out well, and the sheese melted reasonably). 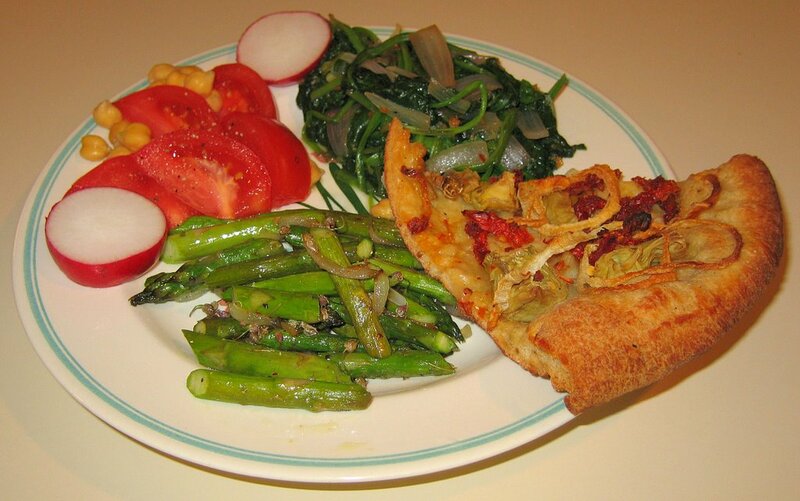 Today, I had spinach, asparagus, and leftover pizza from last Sunday (sundried tomatoes, artichoke hearts, and onions with porcini mushroom oil instead of tomato sauce, from Lilly's pizzeria) to use up. The pizza had dried out and was hard, but passable. I sauteed asparagus briefly with shallot, and spiced it simply with salt and pepper. I wilted the spinach by sauteeing red onion for a minute or two, then briefly sauteeing spinach leaves (including stems, though they could have been removed). I also simply seasoned it. I also heated and served some Amy's Lentil Vegetable Soup. My wife didn't end up liking the soup, and I wasn't crazy about it, either. The spinach was not particularly flavorful; we had it for probably almost a week in the refrigerator, so was past its prime though certainly quite edible. It was a passable meal, but perhaps the least favorite one that I have ever served my wife. Tomorrow will be better! It's nice to be cooking again! I'm still not up to speed, but yesterday and today was able to eat some soup (plus watermelon). But we have a couple visiting from Illinois, friends of my wife's, and how could we welcome them with anything but good home cooking?! So, though I don't have an appetite to try it, I put together what I hope will be a tasty and interesting dish. Their flight is delayed, so I thought I would write about the dish and later upload the picture that I'll take. I have always prepared winter squashes by baking, but today for the first time tried a saute. I asked my wife to do the hard work (while I rested to get ready for the effort) of peeling the squash (most winter squashes would be difficult to peel, but the delicata was not so bad). I cut it in half, the long way, removed the seeds and fibrous membranes, then cut each half into pieces between 1/4 and 1/2 inch wide. I started [my wife just called - they just landed almost 3 hours late; I sent some snacks for them and will be ready with hot dinner plates when they get home in a half hour or so!] the squash sauteeing and enjoyed seeing how quickly it softened and cooked. 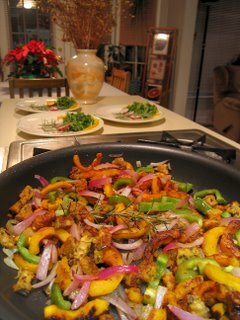 A few minutes later, I added small chunks of tempeh and a little bit of diced yellow onion. A few minutes after that, I added some green bell pepper, small half-moons of red onion (adding ingredients like onions at different times of the cooking can yield interesting results), and a stalk of rosemary. The squash and tempeh were looking nicely browned and done soon thereafter; I added two kinds of hot sauce in moderation, and turned the heat off, waiting for their imminent arrival (I'll reheat a few minutes before they're due and add a little bit of salt and some freshly ground black pepper). I'm also serving a salad with baby arugula, yellow bell pepper, avocado wedge, lime, a touch of organic tangelo zest, fresh oregano from my garden, and salt and pepper. 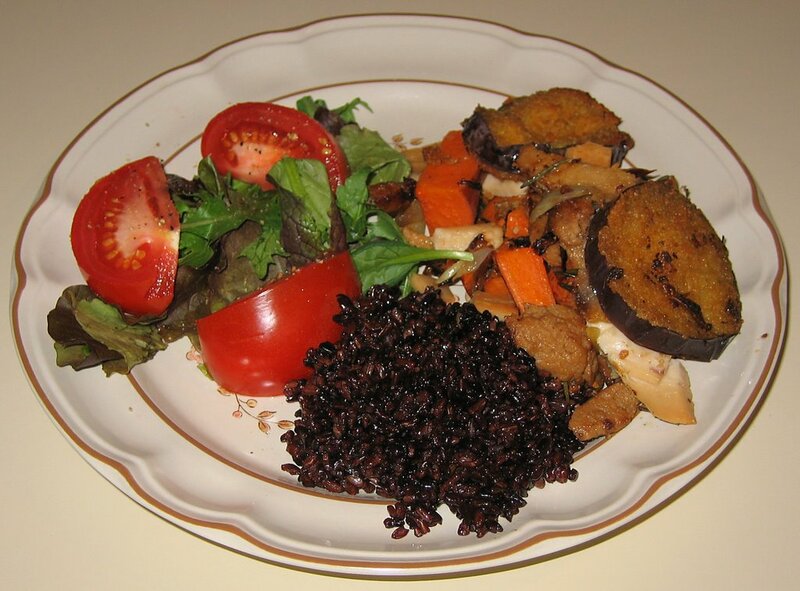 Lundberg Farms Black Japonica short-grained black and medium-grained mahogany rices cooked with a vegan bouillon cube rounded out the meal. I hope that they'll like it and, if there is any left, I hope that I'm up to trying it tomorrow or Sunday. I'm off to finish the preparations! Sorry for not having posted in a while! I thought I would give a short explanation, and hope to be posting again tomorrow or the following day. Let's see - my last post was on Saturday. On Sunday, we had great weather and I went on a fun "Raleigh Rides!" bike ride with a friend. My friend, his wife, my wife, and I then went out (in 2 cars including his brand new Cayman S that he just picked up the day before!) for pizza at my favorite area pizzeria, Lilly's. I was planning to make a nice dinner on Monday, but we were running late to see the film Bobby, so stopped at one of our favorite restaurants, Tower South Indian Restaurant, near the theatre. (Alas, we got to the theatre and found that the film was damaged so wasn't being shown!). Tuesday night was my last cooking class and I knew a number of people couldn't make this class. Unfortunately, I didn't know that nobody would come! I waited an hour then went across the street to return the unopened bag of groceries at Weaver Street Market. Since my wife was going to have dinner on her own, I was tempted by some curried seitan in their hot food line and decided to have a light dinner there and get some errands done. Well, possibly because I'm just not used to eating out so much or maybe there was a problem with the seitan or something else that I had, I ended up waking up on Wednesday feeling nauseated. I spent all day quietly sitting on my easy chair, sipping some ginger tea and nibbling on two pears. My poor wife had to fend for herself and heated some leftovers for her dinner. I was so tired that I slept from about 7:30p till 11:30a this morning! I have a little more energy and am nibbling on watermelon. Since I stopped eating dairy products and became vegan (around 1999? ), I never catch colds or flus, but guess that I'm still susceptible to food poisoning! I hope that I'm able to cook by tomorrow - we have friends of my wife visiting us from Illinois tomorrow through Monday. I bought some nice sundried tomatoes a few days ago; this batch was fairly soft and didn't really need to be first put in warm water for 20 minutes or so, but I did anyway to soften them even more for a pasta dish I had in mind. I sauteed small pieces of artisanal vegan apple-sage sausage by the Field Roast Grain Meat Company, along with an onion, diced to a medium-small size. I cooked the "sausage"-onion mixture well, maybe for 10 minutes, then mixed in a large bowl, along with the tomatoes, fresh oregano from my garden (soon it will be cold enough that the oregano will be gone till spring), pieces of Kalamata olives, and a little bit of organic extra virgin olive oil. I served seashell-shaped organic "conchiglie" pasta made at the Montebello Monastery in Marche, Italy (I love its hearty, chewy texture!) and put the rest of the ingredients on top. 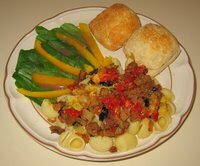 I also served some hot ciabatta rolls and yellow bell pepper slices on top of spinach leaves. Delizioso! We had a nice nacatamale left over from eating out on Wednesday, and I heated it, giving half to my wife and having half, serving atop raw spinach leaves. I also served sprouts, avocado, radishes, and cucumbers. I made what turned out to be a particularly delicious Spanish rice. I modified a recipe that I have in my cookbook and used a whole-grain rice that I really like, Himalayan red. The rice usually is prepared in a ratio of 1 rice to 1 and a half water (I like to use vegetable broth) and simmered for about 20 minutes. What I did, in a small stock pot, is quickly sauteed a medium sized and medium diced onion, equivalently diced half green bell pepper, and 2 cloves sliced garlic. I measured about 2/3 of a small yogurt container of rice, a small can of tomato sauce, and enough water to make a tomato sauce and water combination of more than the 1 1/2 ratio to rice, perhaps twice as much liquid as rice (I like to add more tomato especially if there is likely to be any leftover). When the onion was ready, I briefly put the rice in and quickly stir fried for maybe half a minute, then added the tomato sauce, water, 1/2 to 3/4 teaspoon red chili powder, 1/4 teaspoon or so of whole cumin, a pinch or two of salt, and a medium tomato that I had chopped into medium-small pieces. After bringing to a boil and mixing, I let it sit, loosely covered, on a low simmer for about 25-30 minutes. We loved it! I bought some roasted buckwheat groats (also known as kasha) some time ago and my wife reminded me that I need to try them. They are often used for porridges, and cooked in a ratio of 1 grain to 2 water for about 20-25 minutes (brought to a boil and then simmered till the water is absorbed). 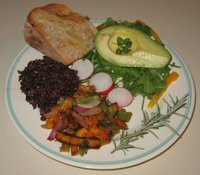 While considering what I might make tonight, I found an interesting recipe on fatfree.com based on a recipe in Eating Well magazine. I modified it and did the following. I used their innovative idea of taking an "egg" (I use vegan Ener-G Foods' egg replacer) and mixing it with half a cup of groats, putting it in a pan, and cooking it quickly over medium high - "to seal the kasha kernels so they don't get all mushy during the subsequent cooking". Then I put in a cup of water and a bouillon cube (I like Rapunzel brand vegan low-sodium), maybe a quarter teaspoon of paprika and a pinch of salt, and some fresh rosemary needles, cut into pieces. I brought this to a boil, then reduced the heat to a low simmer, uncovered, and cooked for about 20 minutes till the liquid was absorbed. On my wife's advise, I then added a little fresh lime juice and some raw onion chunks. In the meantime, I sauteed diced onions and mushrooms. In a 350°F oven, I also started squash (carnival and kabocha) and sweet potato cooking for about a half hour; I cut the squashes in half and removed the seeds, then put them face down in plates with shallow water. After a brief saute of maybe 5 minutes, I mixed the onions and mushrooms into the kasha. 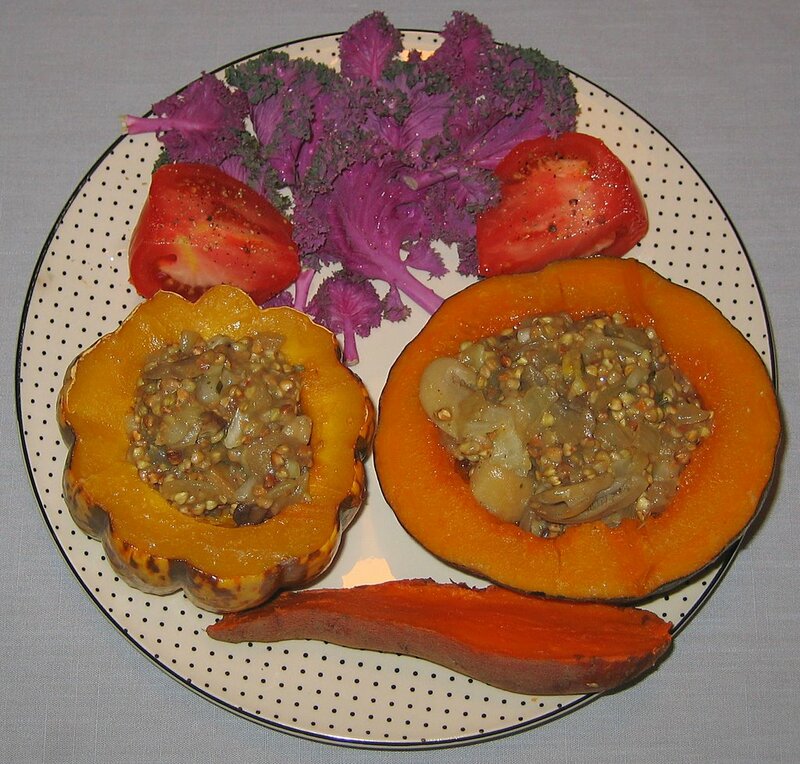 I served the kasha combination inside the two squashes. I also found that the interior leaves of ornamental kale in particular taste quite good raw, so served several leaves with tomato. We enjoyed the meal, and ended up adding some date-tamarind sauce into the kasha. I'd like to experiment more with kasha in the future. Yesterday a good friend of ours wanted to treat us to dinner, so we ate at the Nicaraguan restaurant Xiloa in downtown Durham. We had plantains as appetizers and each of us had the same main course, their very nice nacatamales, Nicaraguan tamales with corn masa cooked in banana leaves. I was thinking of doing something with sweet potatoes, perhaps cooking them with onions as opposed to baking them. Then I thought that maybe I would boil them till they were mostly cooked and briefly then saute them with onions and seitan. What I ended up doing was making a casserole that came out much better than I had expected - we loved it. I cut 2 sweet potatoes into large chunks, maybe 2" long and 3/4" thick and boiled till the flesh was softened just enough to be able to gently penetrate with a knife - a surprisingly short time of maybe 8 minutes - then I drained them. In the meantime, I briefly sauteed seitan cut into matchsticks maybe 1 1/4" long and 1/4" thick, with thickly sliced sticks of shallot; after a few minutes, I put some fresh rosemary needles in. I also briefly sauteed some breaded eggplant. I greased a casserole pan with the some herbed oil, then put in sweet potato chunks followed by the seitan/shallot/rosemary. On top of one half side (the side I'd eat), I added a little vegan Mozzarella "sheese" (from Bute Island Foods in Scotland), then put a layer of the eggplant, and drizzled a little more of the herbed oil, then baked at 375 degF for about 20 minutes. I also put a little of the herbed oil along with a cube of vegetable bouillon in the water with rice in my rice cooker when I prepared Lundberg Farms Black Japonica short-grained black and medium-grained mahogany rices - the oil added a lot of good flavor. A salad rounded out dinner. Tonight was supposed to be the last night of my cooking class, but many had to miss tonight. I postponed to next Tuesday and hope that most will be able to make that class. I made a relatively simple but tasty dinner tonight. My wife picked up more flowering (also known as ornamental) kale, after our very positive experience last Monday. This time it wasn't as fresh, and the resulting dish wasn't quite as tasty as last time, but we both still found it to be quite good. I simply sauteed in a large pot some sweet onion, chopped into large pieces. As the onion started to become clear, I added chunks of apple-sage artisanal vegan Field Roast Grain Meat Company sausage, sauteed a few more minutes, added cumin and quickly sauteed an additional half minute or so (minding that the cumin didn't burn), then turned the heat down to medium and added the flowering kale with most of the stems intact. I stir fried for about 3 minutes or so, cooking the leaves down a bit, then adding salt and freshly ground black pepper. 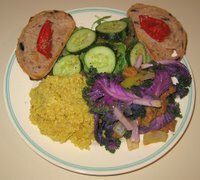 I also made a simple quinoa side dish by very briefly sauteeing a little bit of sweet onion and ginger, then adding quinoa and water in a 1:2 ratio (sometimes I use vegetable broth instead of water, but with the onion I thought I'd aim for a more basic flavor), as well as a little salt, paprikia, and turmeric. I brought it all to a boil for a minute or two, then turned the heat off and let it sit, covered for 5-7 minutes till the water was absorbed and the quinoa took on its characteristic cooked look of an open spiral. I also served some delicious olive bread with roasted tomatoes and cucumber slices over lettuces, with lemon juice, freshly ground black pepper, and salt. Yesterday, my Mom invited us over for some of her Indian cooking, including okra, eggplant, and lemon rice. On Saturday, we had our annual vegetarian society holiday party - it was very well attended with around 50 people! I made my chocolate baklava with pistachios on my wife's request; she wanted to help and learn how to make it. We had fun working together, and the result garnered raves. Tonight we had a very short time to prepare and eat food before heading out to a film. 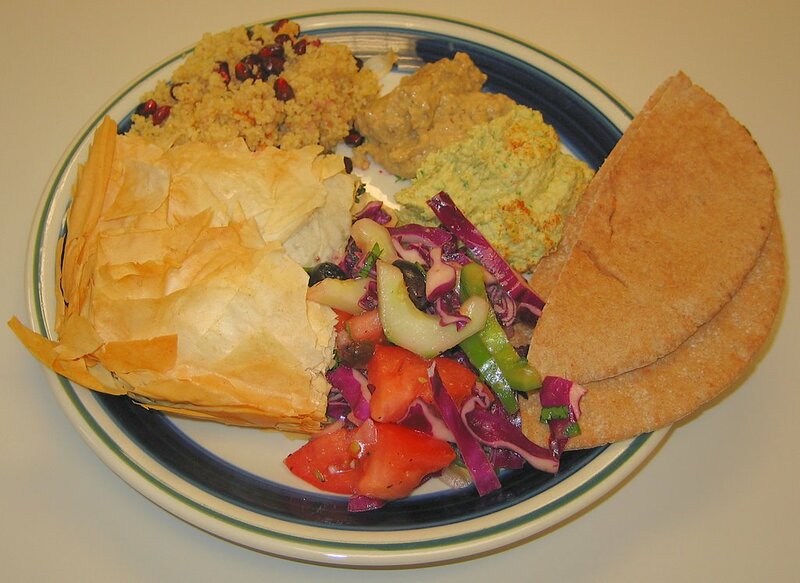 I heated leftover spanakopita from Greek cooking class on Tuesday and also served baba ghonouj eggplant spread atop some crusty lightly toasted bread, as well as Greek Salad. The only dish that I made was a simple spinach one; I briefly sauteed the spinach with onion and a few spices. Yesterday, we were out (I taught a photo workshop then attended a nice 100th anniversary celebration of the Durham Arts Council building), and went to a nice Southwestern restaurant, Margaret's Cantina, before watching another film. 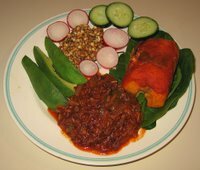 I had enchiladas (one with tempeh, one with spinach) with their (not so) spicy sauce; my wife had a vegetable platter, and we were both pleased with our meals. I loved the alcohol-free blood orange margarita that I had, too! I picked up some zucchini yesterday with the idea of trying something new. I am way overdue for making risotto, and hope to make a butternut squash risotto soon. While we were visiting Italia in October, our friend near Milano who hosted our first and last night cooked risotto with shredded zucchini, which gave me the idea to make a simple dish hilighting the flavor of zucchini (I'll also probably try a zucchini risotto). My idea was to simply shred the zucchini and cook it briefly with onion. I started with thinly slivered onion and a little garlic, and sauteed in a roasted garlic-rosemary infused olive oil till the onion was nicely browning. Then I added the zucchini. I didn't want to make anything like hash brown potatoes, though sometime I think I'll experiment with just that and make zucchini fritters. But I sampled and decided that I wanted to work additional flavors into the dish that was turning out to be rather bland. I added some hot sauce, fresh oregano from my garden, dill weed, salt, pepper, and some more onion (once in a great while when I include sauteed onion in a dish, I add some additional fresh onion shortly before the dish is done to get two different flavors and textures of onion). 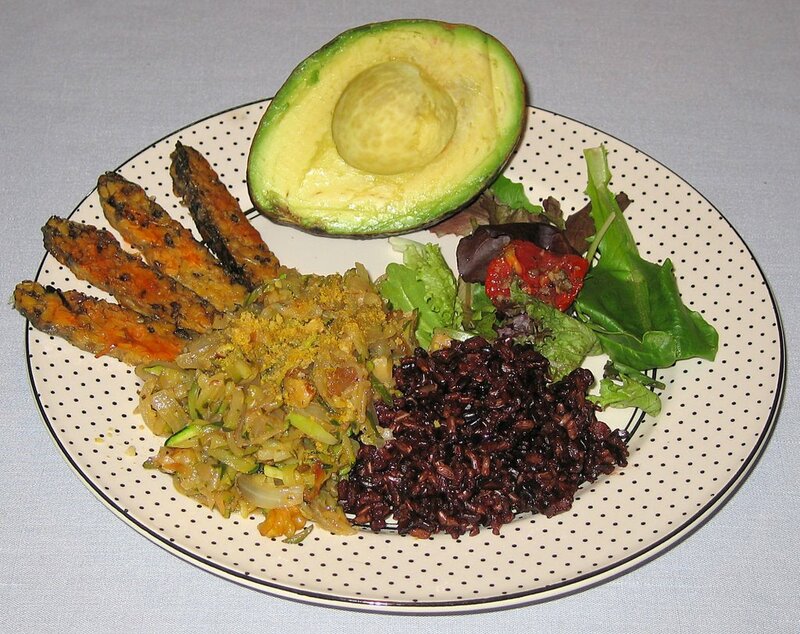 I also served Lundberg Farms Black Japonica short-grained black and medium-grained mahogany rices, sauteed tempeh dabbed with hot sauce, a simple salad with roasted tomato, and avocado. We enjoyed the meal! The zucchini was spiced and flavored just right, we felt, and was filling and tasty. My students made a fabulous Greek meal. We make less in this class than in most as I allow time to learn how to work with filo dough. 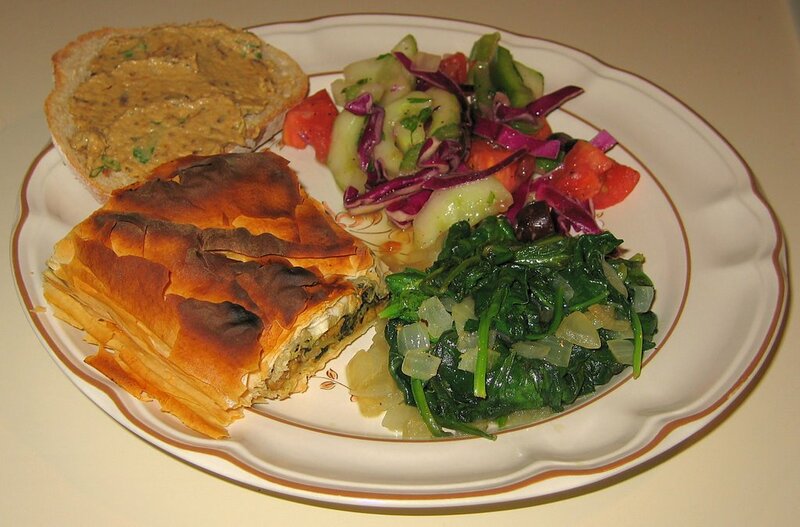 Their spanakopita was excellent, using a herbed tofu, nutritional yeast, and spinach as a filling. The Greek salad had ingredients like cabbage, tomato, cucumber, bell pepper, and herbs, and is a modification of a recipe I saw in the July/August 1995 issue of Vegetarian Resource Group's The Vegetarian Journal about good vegan Greek salads ("Vegetarian History Lessons From A Greek Chef", Larry Litt), and was also very tasty, as were the baba ganouj and hummus. The couscous, meant to be a plain side-dish, was nicely pepped up with pomegranate kernels. Oh, and their chocolate baklava was great! At the store today, I was happy to find some beautiful flowering kale. They had both purple (which I bought - surprise, surprise!) and white. I experimented and my wife and I were delighted with the result! I cut some seitan into small chunks, maybe 1/4 - 1/2" in size. I sauteed the seitan in an infused roasted garlic - rosemary olive oil. As it browned, I added some organic red onion cut into half moon slivers and only cooked for another minute or so before adding a little mustard seed and the beautiful kale leaves. I stir fried for a few minutes, adding some salt. Then I reduced the heat and poured a little Drew's Thai Sesame Lime dressing /marinade into the pan, stirring it and letting it absorb into the ingredients. I repeated a minute later, then served. It looked great and tasted very nice - the leaves had a slight crunch and the veins and all were quite edible. Surprisingly, flowering kale (Brassica oleracea var. acephala; also known as ornamental kale, salad savoy, flowering cole, or flowering cabbage) is conventionally used as a garnish and not cooked, or even just as a showy garden plant purely for its beauty. But this beauty is brainy too - it tastes great and is nutritionally considered by some to be the king of the greens. It is a great source of vitamins A and C, and also offers vitamin E, fiber, iron, and other minerals. As can be expected by its bright colors, it is rich in phytochemicals, which are known to have strong disease fighting properties. I tried to cook it minimally as I suspected the color may fade - subsequent reading seems to confirm this and encourage eating the more tender interior leaves raw. Tomorrow in cooking class I am going to be showing my students how to cook with filo dough. One shortcut is to buy prepared shells, which I rarely do. But I did tonight for a nice and convenient side dish. I found some Athens mini filo shells with spinach in the dough, marked as new (so new that I don't even see it on their website). It is a simple matter of filling the shells and serving cold or heating. This was supposed to be a quick dinner as my wife has an early morning call (6a!) for work tomorrow and we got home hungry from working out after 9:30, so I made a basic filling of seasoned mashed potatoes with chunks of roasted bell pepper (that I had made yesterday) and a dot of hot sauce. I heated this in a 350°F toaster oven for about 5 minutes. 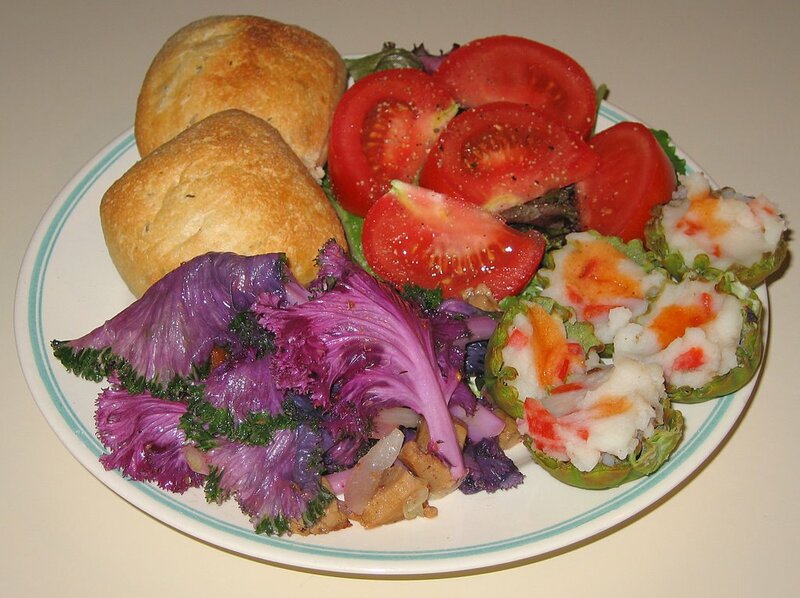 A salad and hot freshly baked (I bought a bag of frozen prepared bread, ready to be baked) ciabatta rolls rounded out the meal. My one regret is not to have taken a closeup picture of the kale before cooking it - I guess I'll have to buy some more :-) ! I'm overdue for making pasta, and made a new sauce today for organic conchiglie (seashell-shaped) pasta imported from Italia. I used a technique I learned on our visit there in October of slowly cooking onion slivers down in olive oil over low heat in a covered pan. As the onion very slowly carmelized, I added in chopped roasted tomatoes (purchased) and roasted bell pepper. I then mixed in some homemade pesto sauce and a little bit more olive oil. To make the bell pepper, I simply put the pepper atop a flame on the gas range, turning it occasionally, till all sides were singed. I like to then put the pepper in a brown bag and crumple the bag closed to allow the smoke flavor to permeate the pepper, but I couldn't find a small bag. Instead, I put the pepper in a container and covered it for 5 minutes or so. When I was teaching earlier this week, my aunt and wife went out to a favorite South Indian restaurant, Udipi in Cary, NC. We are out to a party tonight and wanted to eat, but leave a little space for snacks at the party. I heated the leftovers that my wife brought home - utthapam, a South Indian "pizza" similar to dosa (ground lentils and rice are fermented, like with dosa, but then instead of forming a crispy crepe with optional filling, utthapam is served as a thick pancake with fillings like vegetables or coconut mixed right into the batter), and a spicy tomato rice. 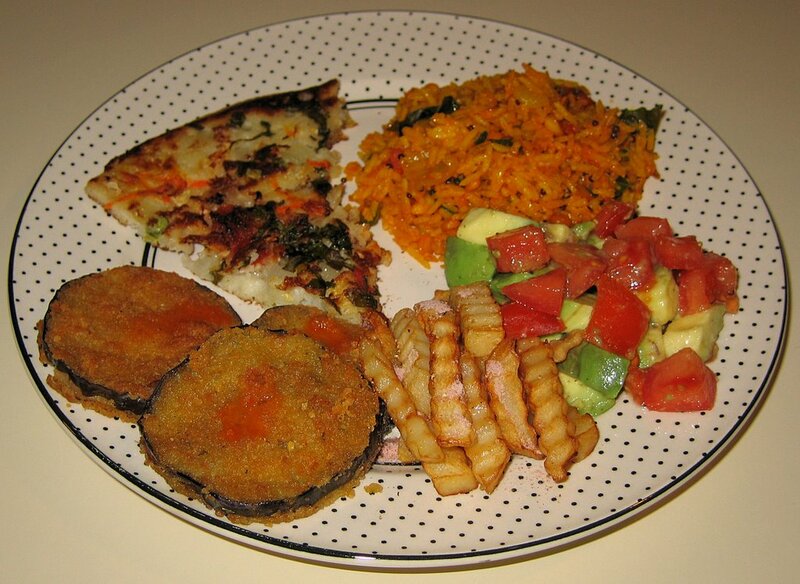 I also served organic Cascadian Farm French Fries with Indian black salt (kala namak, actually pink in color, and with a nicely strong sulfuric taste), breaded eggplant, and a tomato-avocado salad. I still had leftovers from last week's Mexican cooking class, so wanted to finish them. 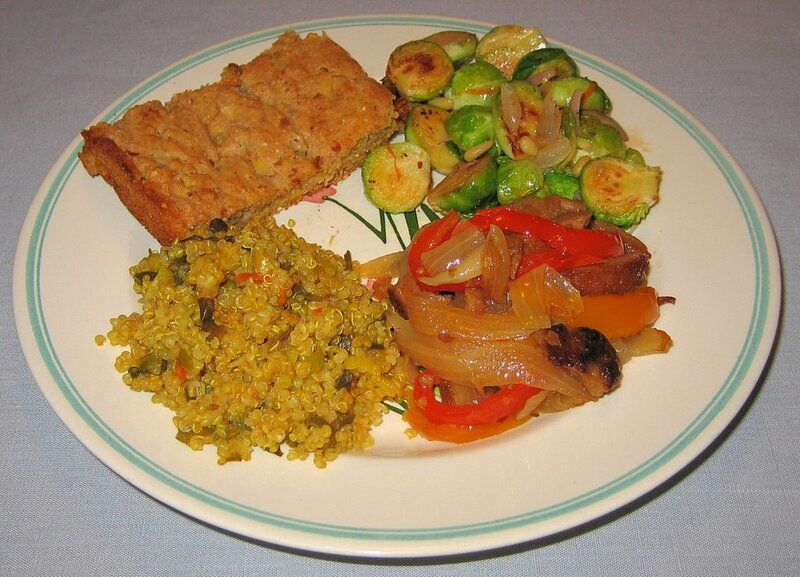 I heated what was left up - cornbread, fajita filling, and quinoa with leeks. I also made some Brussels sprouts; I cut each sprout in half and grilled them, adding, near the end of the cooking, some shallot slices and pine nuts. Then I put it all into a bowl and mixed in some salt, freshly ground black pepper, hot sauce, and a little bit of Colgin Liquid Smoke. I was looking forward to making another dinner for my aunt while she was visiting (she left this afternoon and had been visiting us from Connecticut since November 19th), but she wanted to take my wife and I out for dinner. We recently discovered a very nice but easy to miss restaurant on Durham's Ninth Street, Xiloa. 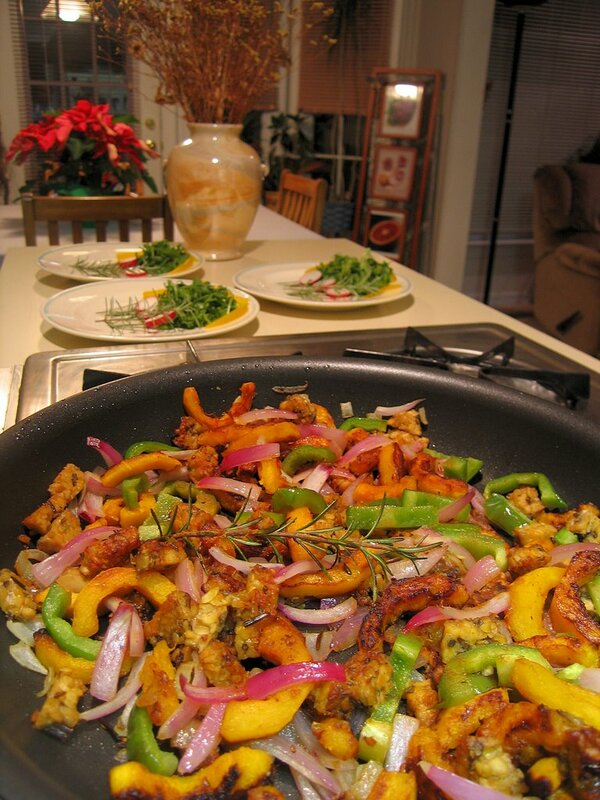 It specializes in Central American food, especially from Nicaragua. It seems that half of their menu is vegan! They make all sorts of great complex juices, freshly made and organic, when possible. So we dined there on Wednesday. I had a cantaloupe juice and my aunt and wife each had a purple cactus juice. I had delicious nacatamales, Nicaraguan tamales with corn masa cooked in banana leaves. We shared thick plantain chips and an interesting fruit salad with mango, tomato, cucumber (so it was a vegetable-fruit plate! ), and other ingredients. Yesterday, my Mom wanted to have all of us over for some homemade pizza. Yummy!